Damage to River Road in Richmond. 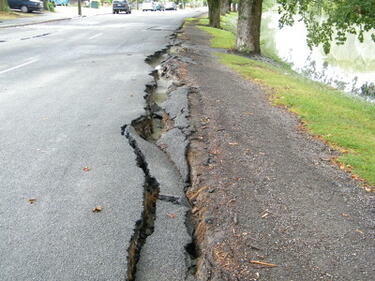 The road surface is badly cracked and slumped, and liquefaction silt covers part of the road. Two people in gumboots walk towards a barrier erected across the road using road cones and warning tape, and in the background the badly twisted Medway Street bridge can be seen. The photographer comments, "Longitudinal cracks indicate lateral movement as the land sagged towards the river. Near 373 River Rd, looking south-east towards Medway St. The Medway St bridge is visible in the background". Damage to River Road in Richmond. The road is badly cracked and buckled, and is partly blocked off with road cones and warning tape. In the background is a truck carrying more road cones and signs. The photographer comments, "Major slumps and cracks along River Rd. Near 381 River Rd, looking towards the Banks Ave - Dallington Terrace corner". 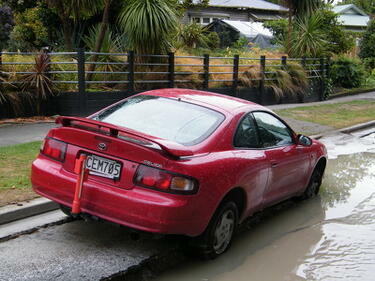 A car stuck in a large pothole on River Road. The wheels on the right hand side of the car have fallen into the hole, leaving the car grounded against the road surface. The photographer comments, "This car belonged to a postal delivery worker - the NZ Post bike rack is mounted on the towbar. The owner must have biked home. Later a tow truck arrived to extract the car from the hole that had opened under its front wheel". Damage to River Road in Richmond. The river bank has slumped towards the river, opening up a large crack along the side of the road. 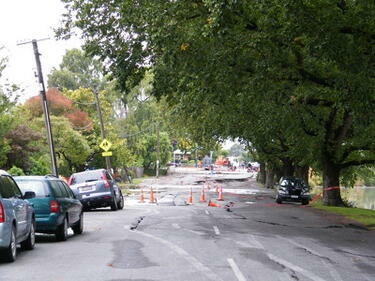 The photographer comments, "Lateral spreading in River Rd". Damage to a house in Richmond. The brick wall is badly cracked and twisted, and some bricks have fallen, exposing the lining paper below. The driveway is cracked and covered in liquefaction. The photographer comments, "These photos show our old house in River Rd. More shaking damage on the east wall of the living room at our house". Damage to River Road in Richmond. 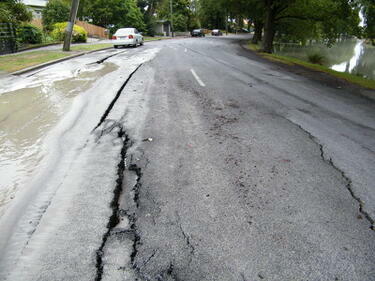 The road surface is badly cracked and slumped, and liquefaction silt covers part of the road. 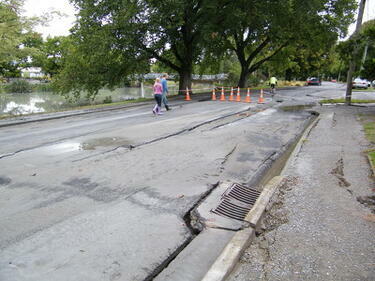 The photographer comments, "Lateral spreading cracks in River Rd". A power pole on River Road is on a lean, stretching the power lines taut. Two lines have broken and are hanging from the pole. 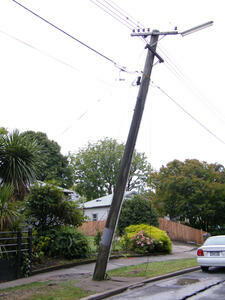 The photographer comments, "Power poles stretched wires to breaking point". Trees alongside the Avon River in Richmond. The river level is high, and the water is grey with silt. 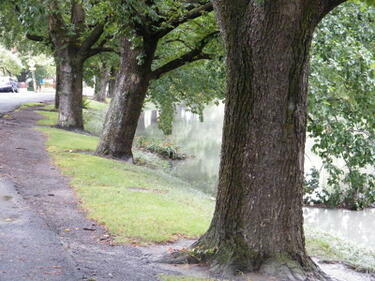 One of the trees is leaning towards the river. The photographer comments, "High river levels because of liquefaction in the Avon. 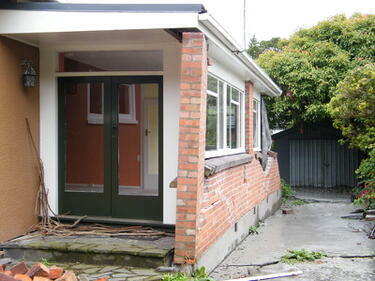 Near 373 River Rd, Richmond". 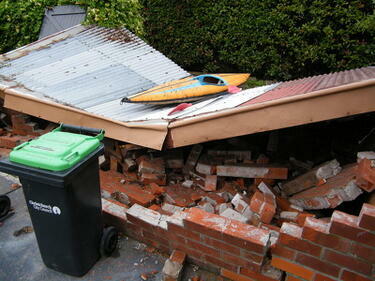 Damage to a residential property in Richmond. The brick wall of the garage has collapse inward, and the roof fallen in on top of it. The photographer comments, "These photos show our old house in River Rd and recovery work around Richmond and St Albans. The neighbours behind us used the kayak to get in to their house - it's flooded by Dudley Creek which runs behind the block, plus major liquefaction. Our old garage provides a good spot to park it". Water and liquefaction flows into the Avon River in Richmond. 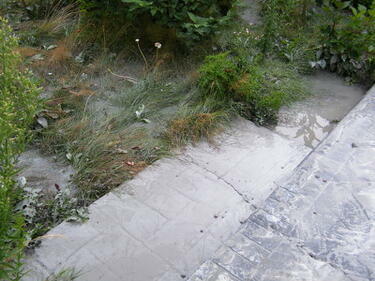 The water level is very high, and the water is cloudy with silt. The photographer comments, "Water from Dudley Creek took a shortcut across the road into the Avon. It doesn't have much of a drop from the road to the river". 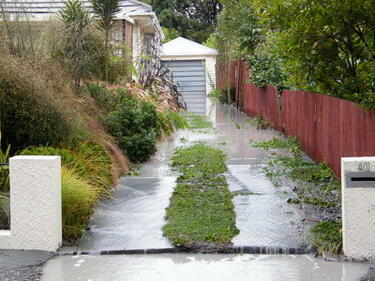 Water and liquefaction run down the driveway of a house in Richmond. The driveway level is noticeably higher than the footpath in front. The photographer comments, "These photos show our old house in River Rd and recovery work around Richmond and St Albans. A house along the block has water running out the driveway". Damage to a house in Richmond. 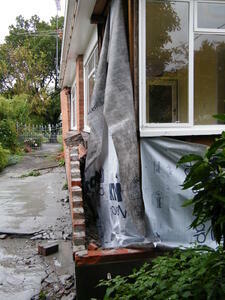 Stucco underneath a window has cracked, and the foundation appears to be on a lean. The photographer comments, "These photos show our old house in River Rd and recovery work around Richmond and St Albans. 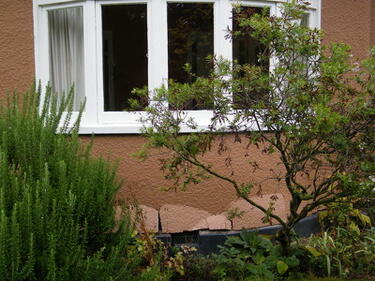 The bay window of our bedroom has jumped off the foundations, cracking the stucco". Damage to the garden of a house in Richmond. Liquefaction is visible among the plants and on the driveway. The photographer comments, "These photos show our old house in River Rd and recovery work around Richmond and St Albans. 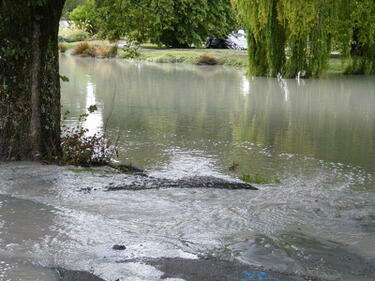 Back lawn under 10cm of water and silt". Damage to a house in Richmond. The brick wall is badly cracked and twisted, and some bricks have fallen, exposing the lining paper and framing below. The driveway is cracked and covered in liquefaction. The photographer comments, "These photos show our old house in River Rd and recovery work around Richmond and St Albans. Does that wall look straight to you? 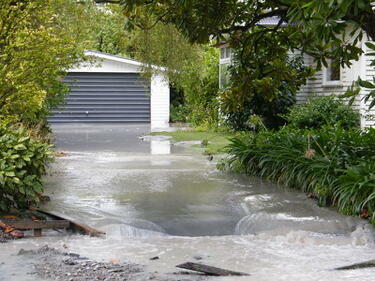 Water flows down the driveway of a house in Richmond. The photographer comments, "Tom and Yvonne McBrearty's house. This lovely house is now on an island in a creek. The water from Dudley Creek found its way to the Avon through their yard. It stopped flowing after two days". Detail of damage to a house in Richmond. The brick wall is badly cracked and twisted. The photographer comments, "These photos show our old house in River Rd and recovery work around Richmond and St Albans. 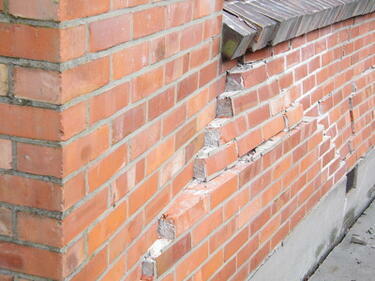 More ruptured brickwork". 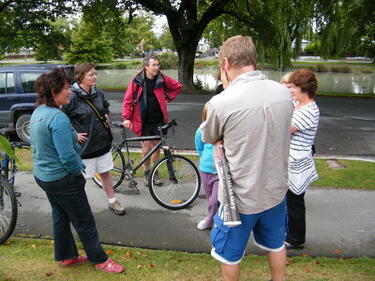 A group of residents stand talking on the footpath beside River Road. The photographer comments, "River Rd neighbours chatting". A man stands on a wooden deck. 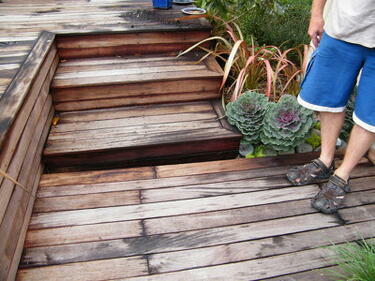 There is a visible gap between the steps and the lower decking. The photographer comments, "Decks and steps have separated". A man inspects damage to his garden. 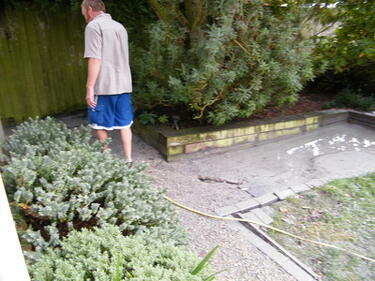 Liquefaction and cracking can be seen on the path and lawn. The photographer comments, "Lateral spreading and liquefaction". 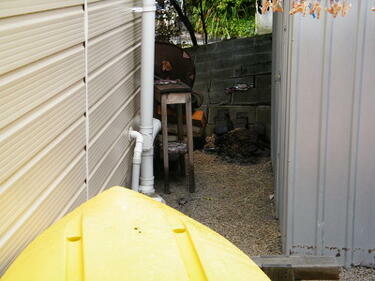 Damage in a residential property in Richmond. A concrete block wall has collapsed. The photographer comments, "Collapsed concrete block fence".